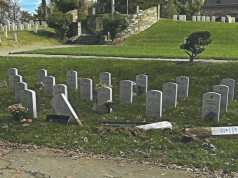 Veteran grave stones were damaged in Alexandria National Cemetery one week before Veterans Day. 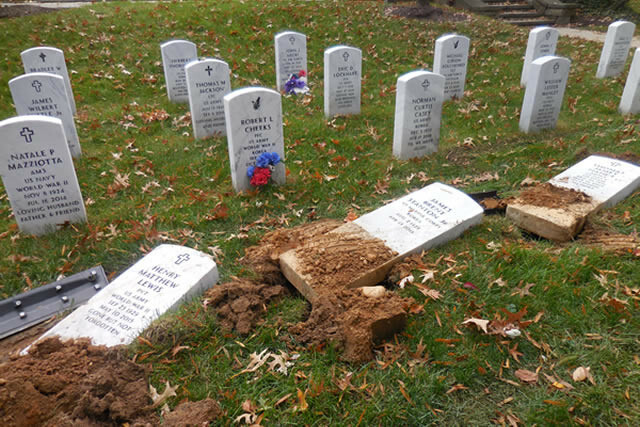 ALEXANDRIA, VA—About a week before Veterans Day weekend, veterans’ gravestones were found damaged after a car crash in Alexandria National Cemetery. Alexandria Police, the National Cemetery Authority and the Department of Veterans Affairs Police were notified and are investigating. It is unclear if the incident was accidental. 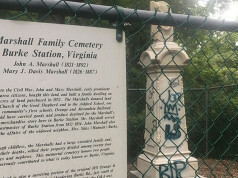 Dog walkers had discovered the scene shortly before the Fairfax County Cemetery Preservation Association had scheduled tour of the cemetery, according to Lipsey. The group holds tours of area cemeteries and was set to visit Alexandria National Cemetery Saturday (1450 Wilkes Street), Nov. 4 from 10 a.m.-2 p.m. The group formed in 2008 after a spray painted grave marker was found at a cemetery in Burke. 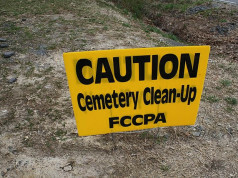 Its mission is to “identify, document, preserve, protect, maintain and advocate for cemeteries in our county that are threatened by development, vandalism or neglect,” according to its website. Alexandria National Cemetery is one of the original national cemeteries established in 1862. It joined the National Register of Historic Places in 1995.